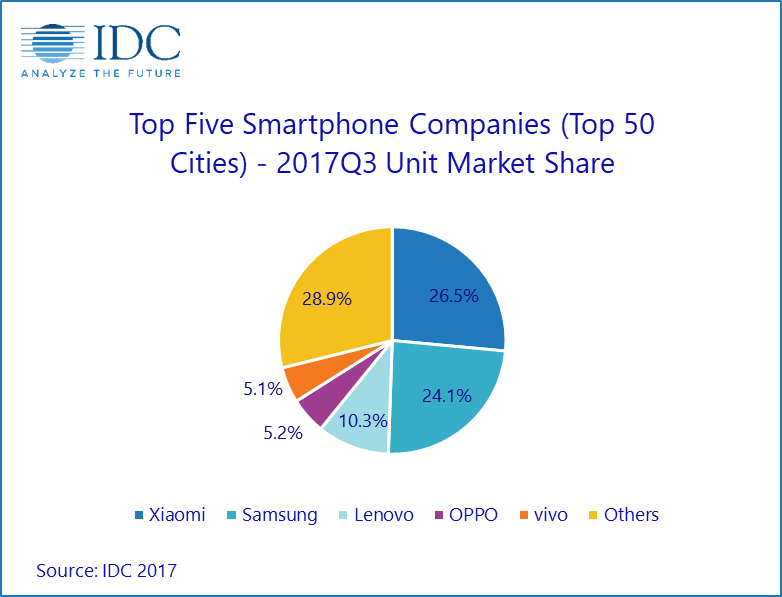 New Delhi, 27th November 2017: According to International Data Corporation's (IDC) latest India Monthly City-Level Smartphone Tracker , major 50 cities of India accounted for 50 percent of smartphone sales in Q32017 with a sizeable growth of 27 percent from the previous quarter. Tier I cities of India continue to be the key volume driver for Indian smartphone market with 29 percent sequential growth in Q32017. Bhopal, Gurgaon, and Jaipur from the Tier II cities have emerged as the fastest growing cities with each growing more than 40 percent from the previous quarter. Metro cities of India remain the major contributors to the smartphone sales in India, with Delhi and Mumbai contributing one-fourth of the total sales in top 50 cities. However, with the availability of inexpensive and large amounts of data and 4G penetration, the demand from Tier I and Tier II cities continue to attract all the smartphone vendors. Vendors are notably diversifying their sales and marketing strategies. Also, the e-tailers are expanding their presence in most of the cities to cater to the demand coming from these markets. “Mega-online sale(s) by prominent e-tailers acted as catalyst for the robust growth across city tiers with e-tailers now contributing around 40 percent of the market in top 50 cities of India,” says Himanshu Jain, Market Analyst, IDC India. “However, the offline channel saw only average traction during the festive season,” adds Jain. Xiaomi moved to the leadership position in major 50 cities of India, registering 120 percent growth in the Q32017. Redmi Note 4 alone contributed to more than 40 percent of the volumes and is also the highest selling model within the top 50 cities of India. Offline expansion through ‘Preferred Partner’ programmes and Mi Stores, further added to this growth. Samsung slipped to the second slot with 15 percent quarterly growth in Q32017. However, it continues to dominate in the majority of cities owing to its deep penetration and reach. Galaxy J2, J7 Max, J7 Prime & J7 Nxt together make up to 50 percent volumes for the vendor. Lenovo (including Motorola) remains at the third position growing steadily at 8 percent from the previous quarter. New Delhi, Mumbai, and Bengaluru contributing around 40 percent of its volumes with majority sales of K6 Power, Moto E4 Plus & K6 Note. OPPO moved up to the fourth position as its models F3 and F3 Plus gained momentum. Also, the newly launched A71 is gaining positive sentiments at sub $200 price point. vivo slipped to fifth position as its sales declined marginally from the last quarter. Reduced channel spends were the primary reason for this. However, the vendor is expected to revive at the back of newly launched V7 Plus and Y69 in the coming quarters.